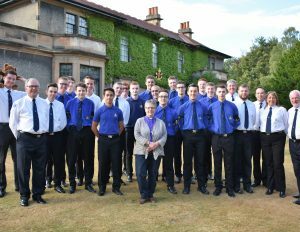 The Rt Rev Susan Brown, Moderator of the General Assembly of the Church of Scotland, has praised the young people attending The Boys’ Brigade’s KGVI youth leadership course on a visit to Carronvale House on Monday (16 July). Mrs Brown who was previously a KGVI course chaplain in 2009/10, spent time chatting with the young people and hearing their views on range of issues – including international affairs and their future careers. Susan was even questioned about the various celebrities she has married as parish minister in Dornoch!